‘Grace’, ‘unmerited favor’, ‘give that boy some elbow room’, however you express it, we need it, and we need to understand it. The subject brings so many things to mind for those in the body of Christ. From feelings of joy, excitement and gratefulness, to nervousness, fear of abuse, and fear of one being a ‘change agent’ or ‘liberal’. The problem has been and is, and will be, one of ‘balance’. The lack of which often results in church arguments, ‘splits’, ‘splintering’ and division, but not peace and unity. We sing about grace, and mention it in sermons and at times we verbalize it in prayer. We just don’t know much about it. We are so “subnormal, when we see someone normal, we think they are abnormal!” Our emphasis teeters towards performance/ success syndrome. We are better on specifics than generics, better on commands than the underlying, under-girding principles that support them. We are strict on “authority”, but weak on mercy. We amplify words like “commitment”, “performance”, and “obedience”!!! It is rather hard to deny the “out of balance” charges when, as a brotherhood we have only produced a handful of books on the subject in the last 50 years. This is an indictment and a rather shameful revelation of a people who speak of restoring New Testament Christianity. Surely GRACE is the keystone of such a noble project as restoring New Testament Christianity. For too long, this subject has been one viewed with caution instead of being embraced with joy. The fear of the ‘abuse’ of God’s grace has resulted in a loss of BALANCE on the subject. Uncertainty has ‘kicked’ the joy of our salvation to the side in the lives of many Christians. “Are you saved?” Someone asks… A sheepish reply comes back, “I hope so.” or “I just don’t know”. Clouds of discouragement come, as we try to ‘walk the line’, only too often to find ourselves unable to ‘do it as well as expected’. We need… (No, we MUST) understand God’s wonderful grace. Without it, I hate to think of, where I would be, and where any of us would be. Yes, there are plenty of scriptures that speak of God’s saving grace. There are plenty that speak of faith, obedience, as well as commandment keeping. To bring it all into BALANCE so that one scripture neither contradicts, out-weighs nor ignores the other scriptures requires an honest search for truth and desire to “rightly divide the word of truth”. This is similar to ones search for truth on “What must I do to be saved?” There are scriptures that say, “believe on the Lord” and you’ll be saved (Acts 16:31), “repent and be baptized…. in the name of Jesus Christ, for the remission of sins…” (Acts 2:38), “confess with your mouth, Jesus is Lord, and believe in your heart that God raised him from the dead, you will be saved (Romans 10:9). Obviously, we cannot ‘pit one verse against the other’, nor can we ignore important verses on a subject and pick the ones we want to support a position or belief… IF we are truly searching for truth. BALANCE will bring you the correct understanding, that all of these play a part in one’s coming to Jesus and finding salvation. They are all part of God’s plan of salvation. All are included in “For it is by grace you have been saved through faith— and it is not from yourselves, it is the gift of God” (Ephesians 2:8). Pray for BALANCE, we all need it. 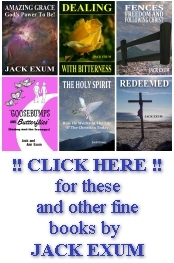 (For those who wish to study the ‘ABC’s of Grace’ by Jack Exum, it is provided free of charge under “Books by Jack Exum” in this site. Thank you for visiting this site.